Sometimes I find malware interesting. This function uses the PEB (Process Environment Block) of the current process (stored at fs:[30h]) to locate a linked list of loaded modules. The PEB contains a member called Ldr that is a pointer to a PEB_LDR_DATA structure. This structure contains a set of LIST_ENTRY structures that point to linked lists of LDR_DATA_TABLE_ENTRY structures. The InMemoryOrderModuleList linked list is used to enumerate the loaded modules by the order that they're loaded in memory. For each module in the list, it does a simple hash of the first 24 bytes (or 12 Unicode characters) and checks the hash against a certain value (0x6A4ABC5B). This value happens to be the hash for "kernel32.dll". Once this module is located, the base address is returned in the EAX register. After some Googling, I found out that this code was originally created by Stephen Fewer of Harmony Security in June of 2009 and described in his blog post. 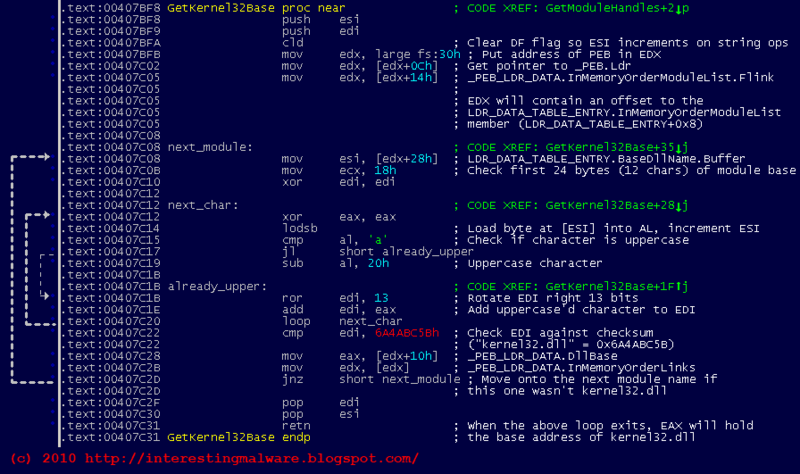 It was intended for use in Win32 shellcode, and it's no surprise that malware authors are now using it. Of course, I didn't bother with the Googling until after I fully analyzed the function... I could have saved some time if I just searched for 0x6A4ABC5B like a good malware analyst generally does when finding a function with a hardcoded value... Lesson learned!